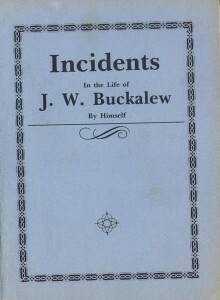 The author of Incidents in the life of J.W. Buckalew was a Church of God Evangelist. He was born John W. Buckalew in Trion, GA, on 23 July 1870 and he died 24 Jan 1918, 47 yrs old. He was the son of an ordained deacon in the missionary Baptist church in Trion who strayed from that fold into gambling, drink, running from the local law, and other diversions before finally being saved. 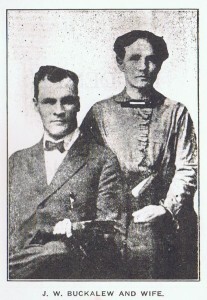 He was married to Mattie Hines (1868-1941) on 11 Aug 1889 and had a son Jessie (1890- 1890); son Collie Belton Buckalew (1891- ) and a daughter named Grace (Truman Chandler, 1893-1955). He lived in many locations across Alabama and before 1909 was receiving training at the Pentecostal Tabernacle in Nashville, TN.